It is one of the most significant architectural monuments of Romanesque and a significant example of monastic building of the early twelfth century. 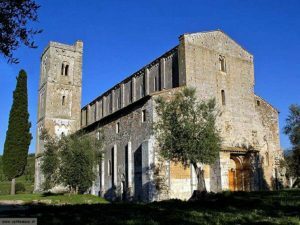 The magnificence of the church is enhanced by the surrounding landscape where the olive gathering is the key element. According to tradition it was founded by Charlemagne, but the first certain document dates back to 814, at the time of his son Louis the Pious. 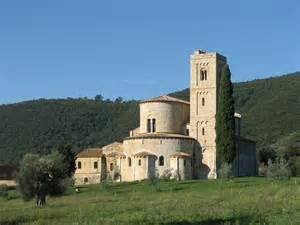 It was originally a powerful Benedictine abbey, so much so that in medieval times the abbot was one of the largest landowners in the area. 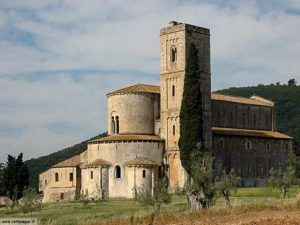 In 1291 he passed to Guglielmites and, in 1462, was suppressed by Pope Pius II and annexed it in Montalcino, which was elevated to a diocese with all’inglobamento the Abbey itself.